CHICAGO – What does the title of Alison Klayman’s new documentary, “The Brink,” mean? On the surface, it is a fly-on-the-wall profile of right wing operative Steve Bannon, who worked for Donald Trump’s campaign in 2016 and was on his executive staff at the White House, until he unceremoniously resigned. 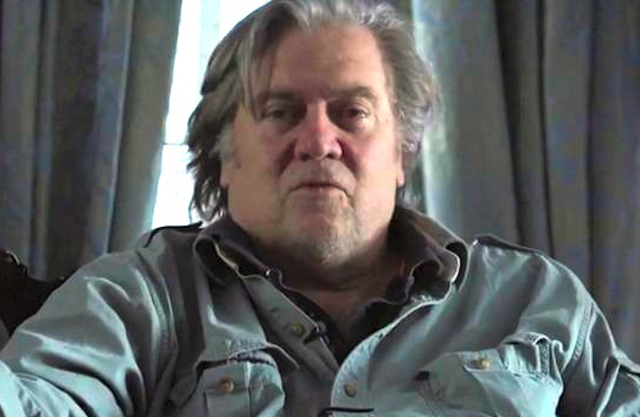 But below the Bannon profile is a remarkable film about the nature of what Bannon does, creating nationalist division while pretending to be a righteous political warrior. Filmmaker Alison Klayman, notable for award-winning documentaries like “Ai Weiwei: Never Sorry” and Netflix’s “Take Your Pills,” got unprecedented access to Bannon, following him throughout 2018 as he reinvigorated his strategies after the White House disgrace. He is a globe trotting “advisor” to many Donald Trump-like campaigners while Klayman followed him, and in the film he talked about his philosophies, especially his watery description of himself as “economic nationalist.” The film busts Bannon in a way, allowing his own rhetoric and narcissism to harshly define him. For followers of this tenuous and difficult political environment, it is a must see film. In Part One of a Podtalk with Patrick McDonald of HollywoodChicago.com, Alison Klayman of “The Brink” talks about the goals of her profile of Steve Bannon. In Part Two, Klayman talks about the personal side of Bannon, plus the persons who are financing his efforts. To finish the Podtalk, Alison Klayman talks about her other work, and gives a summation of her experience with Steve Bannon. “The Brink” continues its limited nationwide release in Chicago on April 5th. See local listings for theaters and show times. Featuring Steve Bannon. Directed by Alison Klayman. Not Rated.